"Countries may not like what we do, but they respect what we do," Haley told reporters Tuesday. Nikki Haley made a bold claim about the Trump administration's world standing when she announced her surprise resignation as United Nations ambassador on Tuesday. "Now, the United States is respected," Haley said at the White House, seated next to President Donald Trump. "Countries may not like what we do, but they respect what we do." Respect wasn't the word that sprang to mind last month when Trump told the U.N. General Assembly that his administration had accomplished more than any other "in the history of our country," and some world leaders broke out in laughter. And around a week later, the Pew Research Center released a study that found "Trump’s international image remains poor" and that "America’s global image plummeted" after his inauguration in January 2017. It is not news that the president is broadly disliked abroad. 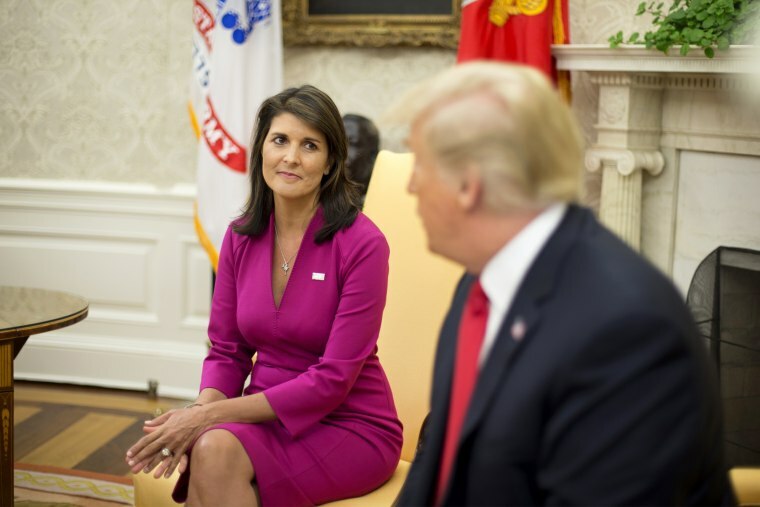 However, some commentators have pointed out that Haley was not talking about popularity, but was suggesting that Trump's team had earned a begrudging respect from other nations that may not like the administration but at least know it means business. China has experienced the brunt of this brusque brand of foreign policy. Trump's view is that previous U.S. governments have been too soft on Beijing, allowing it to become a global adversary that deals in unfair trade practices and intellectual property theft. Last month, the president slapped tariffs on some $200 billion of Chinese imports, with China hitting back with its own levies on $60 billion of American goods. Many commentators have criticized the U.S. policy as illogical and ill-conceived. Economists have warned that a trade war would hurt both countries and the world. "Trump has voiced things that previous American presidents have probably thought but not considered it appropriate to act on." At the same time, Trump has spoken fondly of Chinese President Xi Jinping, calling him "my good friend" and trying to work with him on North Korea. Whether this translates into Chinese respect for the U.S. is up for debate. "They are very weary about him and they realize they've got a significant problem. Is that respect? I don't know," said Kerry Brown, professor of Chinese studies at King's College, London. "They are shocked and surprised by what Trump has been doing because they assumed he would never be as truculent and tough as he has been," Brown added. "They've found it difficult to work out what this administration is up to. They've found it a bit confusing." In this month's Pew study, only 31 percent of people across 25 countries said that the U.S. plays a more important role internationally than it did 10 years ago. Compare that with 70 percent who said the same for China. As Trump focuses on domestic issues with his "America First" policies, Beijing has stepped up massive infrastructure projects around the world and appears to be moving into a closer relationship with Russia. In Europe, Trump has shaken up the postwar international order by suggesting he would be reluctant to defend his NATO allies unless they spend more on defense. He has also appeared to cozy up to Russian President Vladimir Putin while excoriating longtime U.S. allies like German Chancellor Angela Merkel. However, often lost among the hubbub is a fact many experts and officials concede. While the way Trump goes about it may be unconventional, he does arguably have a point: For too long, America's wealthy European allies, namely Germany, have not paid their way in NATO, enjoying the protection of the U.S. while failing to meet defense spending commitments themselves. "Trump has voiced things that previous American presidents have probably thought but not considered it appropriate to act on," John Lough, who served as NATO's information representative in Moscow during the 1990s, told NBC News last month. Other presidents, including Trump's predecessor Barack Obama, have certainly called on the Europeans to spend more on defense. What has caused alarm in European capitals is Trump's suggestion that protection might be conditional on this demand — undermining the central pillar of the alliance. Lough, who is now an associate fellow at London's Chatham House think tank, says Trump has sowed unrest and confusion in Europe because he is "capable of speaking out of both sides of his mouth and saying completely contradictory things." Strip all of that away, however, and he says there may be more than a grain of validity in Trump's argument. "Burden-sharing has been an issue for decades," Lough said. "What many senior American officials have said for a long time is that the Europeans cannot be free riders." There's evidence that this tough talk has earned a sort of reluctant respect in France, as The Washington Post points out. Among the French, Trump's popularity ratings are among the lowest in Europe. But ask them whether they think the U.S. is as powerful a world leader as it was 10 years ago, and more now say yes than at the end of Obama's presidency. In Russia, for all of Trump's personal overtures toward Putin, his administration has taken a tougher stance than most people realize. It has sold anti-tank missiles to Ukraine forces who are fighting Kremlin-backed rebels, expelled 60 diplomats over the poisoning of an ex-spy on U.K. soil, and slapped sanctions on dozens of individuals and entities. This may explain why confidence in Trump there has plummeted 34 points from a high of 53 percent last year, according to Pew. A notable exception to Trump's global popularity abyss is Israel, likely thanks to a string of pro-Israel policies including moving the U.S. Embassy to Jerusalem and cutting Palestinian aid. The inverse of this sentiment was evident in a tweet Tuesday, after Haley announced her resignation, from Abdul El-Sayed, who recently failed in his bid to become America's first Muslim governor in Michigan. Trump's withdrawal from the Iran nuclear deal was also popular in Israel. Experts said Tehran had kept its main promises under the agreement and the other signatories — Britain, China, France, Germany and Russia — have pledged to try to keep it alive. Reacting to Haley's resignation, Gholamali Khoshroo, Iran’s envoy to the U.N., said that America's international isolationism had increased during the ambassador's tenure, state media IRNA reported. According to IRNA, Khoshroo said Haley was "one of the anti-Iranian figures of the United States government [who] has always taken strong stance against Iran."